GABRB3. This is the Epilepsiome page for GABRB3, which is associated with a broad range of epilepsy phenotypes ranging from familial GEFS+ to severe early-onset epileptic encephalopathies. While our Epilepsiome page for GABRB3 is still under construction, we have linked to our blog post from 1/16/2017 that featured our publication in Neurology. Blog post from 1/16/2017 – Beta-3. Even though the gene for the beta-3 subunit of the GABA-A receptor (GABRB3) has not been mentioned frequently in the context of epilepsy genes, it is a gene that is frequently involved in genetic changed that give rise to epilepsy. Given that GABRB3 is one of the genes found within copy number changes on chromosome 15, it may predispose to human epilepsies through various genetic mechanisms including copy number variations and de novo mutations. In a recent publication in Neurology, we reviewed the phenotypes of patients with GABRB3 variants and found an unusual complexity of sporadic and familial cases. Here are three things that I have learned about GABRB3. Figure 1. In our recent publication in Neurology we identified 22 patients with variants in the GABRB3 gene. 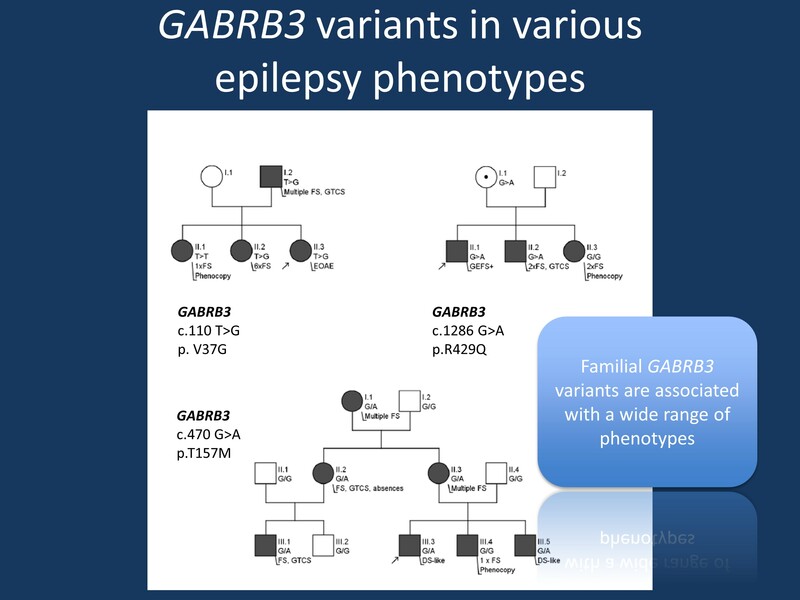 GABRB3 is a gene with an unusually broad phenotypic range including three families with dominant inheritance. Given the complexity of translating findings from patient with de novo pathogenic variants to familial cases, the precise role of each of these variants identified in families remains in question. GABRB3. The GABRB3 gene encodes the beta-3 subunit of the GABA-A receptor. While this gene has been implicated in the context of neurological diseases prior to the exome era, its role in epileptic encephalopathies became obvious with the publication of the initial Epi4K study. In this study, four patients with de novo pathogenic variants were identified. In a follow-up study, three additional patients with de novo duplications were identified in the same cohort. In addition, this gene was also identified in other cohorts. Our recent publication in Neurology reviewed the phenotypic data of 22 patients with GABRB3 variants. And what we found was an unusual spectrum hiding behind a gene that we initially considered a pure gene for epileptic encephalopathies. Here are the three things that surprised me about the GABRB3 gene. 1 – Entering GEFS+ territory. More than 50% of patients for whom data was available had fever-induced seizures. While provocation of seizures in the setting of fever is not unusual for patients with severe epilepsies, this spectrum also included milder phenotypes within the fever-related epilepsies. Interestingly, five patients with Myoclonic-Astatic Epilepsy (MAE) were identified, an unusually high frequency of this phenotype for a novel epilepsy gene coming out of a study of patients with West Syndrome and Lennox-Gastaut Syndrome (LGS). Taken together, the GABRB3 spectrum is relatively broad with a preference for fever-associated epilepsy syndromes and generalized epilepsy within this spectrum. 2 – Familial cases. In addition to patients with de novo pathogenic variants, we identified three families with dominant inheritance. All three families had familial fever-associated epilepsy syndromes, even though not all families formally fulfilled the criteria for Genetic Epilepsy with Febrile Seizures Plus (GEFS+). All three families had one individual who was a phenocopy, i.e. a family member with febrile seizures, but not the familial GABRB3 variant. Also, there was incomplete penetrance in some of the families. The observation of familial variants raises an important point – as these variants had not been seen previously and since the families are small (Figure 1), it is difficult to assess whether these variants occur by chance or whether these variants are causative. We simply do not have a good framework yet to translate findings from de novo pathogenic variants to inherited variants, even though many recently identified genes probably have milder familial forms. 3 – Imaging findings. The patients with pathogenic GABRB3 variants had a range of MRI findings. These findings included polymicrogyria, diffuse hypomyelination, a hypoplastic cerebellum, and atrophy affecting the cortex and the brainstem. Findings were limited to individual patients each, but in total almost one third of patients had some MRI findings, a frequency that is much higher than what would be expected in a cohort of patients with a new gene for an otherwise non-lesional epileptic encephalopathy. Other aspects. There are further aspects that make the GABRB3 story unusual. For example, our functional studies suggest that the disease mechanism is a loss of channel function. However, this will make the interpretation of the duplications affecting GABRB3 complex. Also, we have seen several recurrent variants within GABRB3. However, most recurrent variants were found to have a broad phenotypic range. For example, bifrontal heterotopias on MRI were seen in one patient with a de novo p.R232Q variant, but a second patient carrying the same de novo variant had an unremarkable MRI. What you need to know. We expanded the phenotypic spectrum of GABRB3 pathogenic variants in our recent publication in Neurology. The GABRB3 gene did not behave as expected. We stumbled upon a spectrum of patients with various phenotypes, including patients with neuroimaging findings. This indicates that genes identified through large-scale genetic studies may present as a phenotypic range that seems incompatible at first. Understanding why genes like GABRB3 have such a wide phenotypic range will be one of our tasks for the future.